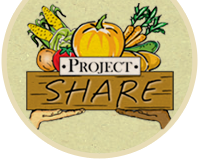 Project SHARE (Survival Help And Recipient Education) is an interfaith cooperative effort, begun in 1985, involving over 66 local congregations, schools, and civic organizations. Contributions of food, money, and volunteerism provide essential basic assistance to more than 1000 families each month. Assistance is provided in the communities of Carlisle, Carlisle Springs, Mt. Holly Springs, Boiling Springs, Gardners, Plainfield, New Kingstown, and Middlesex. Of those needing assistance, about 20% are seniors and nearly 30% are children. Our church partners as a site for the 8-week Summer Reading Program and helps pack backpacks weekly throughout the school year.